It feels so good to have a quilt finished! This one is majorly cute, I’m in love with those little cars. It measures almost 36 in. by 47 in. I did some loopy quilting on this one, mostly just to try something new. For some reason my sewing machine decided to not go full speed while I was quilting, so I had to quilt it slower than usual. Luckily after some “choice” words and threatening to throw it over the balcony it decided to speed up a bit, but it still made me nervous. For as much as I use that poor machine I should probably go get it serviced more often than never. That backing fabric makes me so happy! I put this one in the shop while I contemplate whether or not I should keep it. But after filling 5 of those giant silver tubs with quilts during moving I’ve decided I should probably try to cut back. Luckily this one wouldn’t take up that much space right? I say that about every single one I keep. That’s why I have tub(s) full. I LOVE this one! My little guy is 9 now but I still love that boy stuff. Thanks for sharing your wonderful ideas!!! Very Cute Quilt. I love the quilting you did. Simple loops. This is adorable. I love all the little cars, and the loops are awesome! Love it!!! Seriously cute stuff. Oh and did you notice I am now the third Heather to comment – must be a record or something – LOL! Super cute. And I really like the red binding. It's usually hard to find really cute quilts for boys, but not so today!! GREAT job! It's wonderful! Love everything about it. I'd want to keep them all too. You know, someday you'll have grandchildren, right?!?! Justification. the quilt is just fabulous…i love this desgin, did you get the pattern from a book or tutorial you can tell me about? Where did you find that backing?? I simply must have some! I love that quilt! It is so bright and happy!! What a great job!!! So! incredibly cute. Nice work. Shh, I'm the same way with my machine. No service since I got it 4 years ago. I can't bear to part with it for that long. So CUTE!! Turned out great. I love, love love the wonkiness! Just out of curiousity, what kind of a machine do you use? The backing is just brilliant!!! I love love love it :) Love the loopy quilting too! Incredibly adorable. I love the swirly quilting, and you've given me encouragement to quilt my Nine-patch top in all white, it looks great on this. But, damn you for making me all nostalgic for cute wee little boy things – mine are now old, old, men of 5 and 7! What a sweet quilt for a little man!! this is so so so adorable. i love it. The quilting is so fun. i want to give that a try. This quilt is really very, very beautiful. Love it! That is going to make some little boy very very happy. Or little girl too! 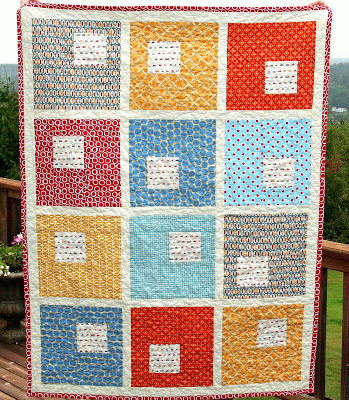 I stumbled on to your blog today and I love this quilt. How big are the large squares and how big are the small car blocks? What a darling idea! it's nice to see a cute boy quilt! very nicely done! Very Cute Quilt. I love the quilting you did. …. I have to say that I LOVE this quilt. Definitely inspires me to do something like it. By the way, I love seeing the LDS link at the bottom of your sidebar!